I hope everyone has a safe and happy New Year! Wishing you lots of scrappiness and good times in the year to come! We are home tonight chillin' (literally) with the kids. They are so excited to stay up until Midnight--we'll see if they make it-hehe! 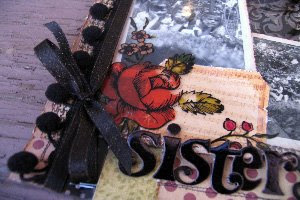 Here are a couple of sneak peeks of the Bad Girls January kit---I am so in love with it! The reveal is January 5th! And a couple of cards to share-why? 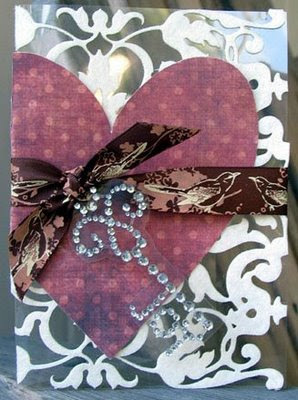 just because.... this little number was published in a recent Paper Crafts issue-so easy to create! And it's never to early to start thinking of Valentine's Day cards-am I right? This one is made of acetate, decorated with a Prima felt mattie, hand cut heart from Prima paper and then an awesome little bling key from....you guessed it--Prima. Oh yeah-the ribbon too! All of it! I can't believe it is only a few days until Christmas! I am just finishing my cards tonight to send out--very bad! But at least I made them this year! I will post a photo of them tomorrow. I scraplifted a Hero Arts card because I am creatively wiped out! Well not really-just too lazy to come up with something on my own-hehe! The Hero Blog has so many amazing ideas and they make me want to buy every single stamp they make. It drives me crazy! I have no room for anything more but I can't resist! Let alone having the time to play with them. 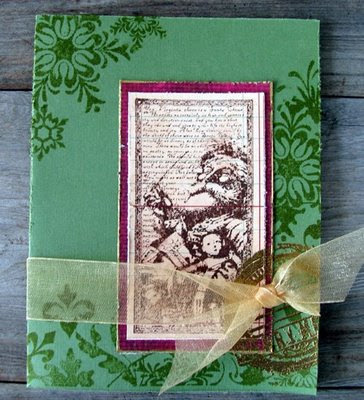 Here are some more last minute ideas for all of you looking for something to create or maybe file away until next year. After Christmas sales are the best time to purchase some plain glass ornaments-they get marked down to almost nothing. I buy a bunch of plain colored large glass ones that come in boxes and stash them away. 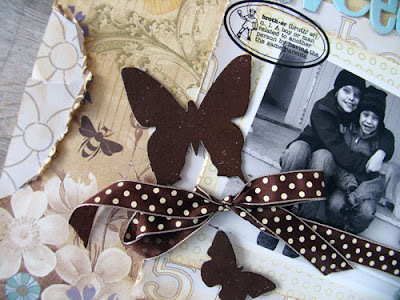 This project is also a great way to use up extra flowers or embellishments too! 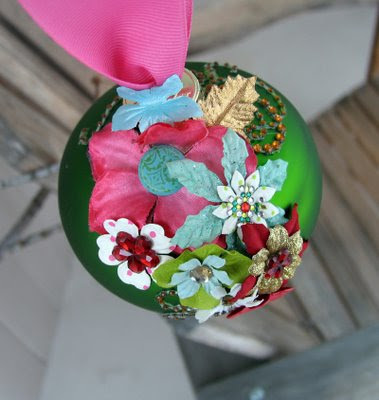 These are some ornaments I adorned with Prima flowers and swirls. These were harder to photograph than I thought-I wanted to get all of the angles so that you can see all of the details. 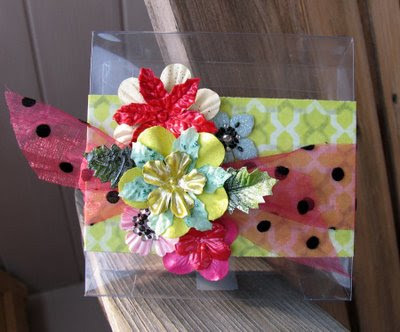 And here is a cute little gift box I embellished to hold a gift card. It's one of the boxes some of my Prima flowers came in. 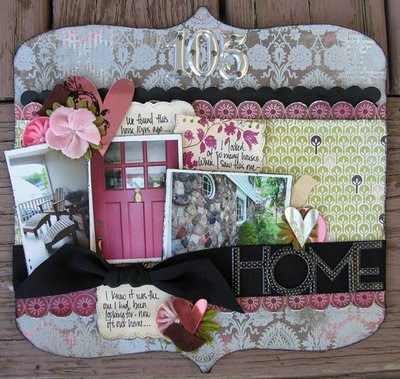 I love re purposing stuff! 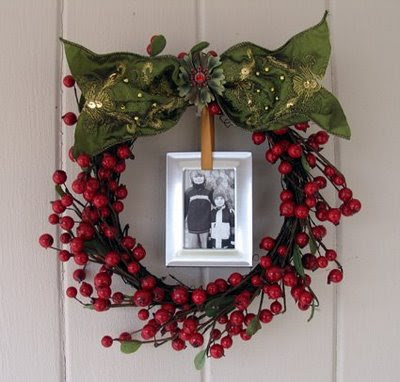 This cute little wreath was so easy to make! I bought an inexpensive little berry wreath at JoAnns and I found a cute little wallet sized frame at Target. I put the photo in the frame, wrapped the ribbon around it, replaced the back and tied it to the wreath. Then added a fancy bow at the top with a flower in the center. I gave this to my Mom and she LOVED it! I guess it never gets old when your kids make you homemade gifts for the holidays! We got a ton of snow yesterday! So the kids will be sledding for sure! It certainly feels like the holidays with all of that gorgeous white stuff floating around. I hope to get a lot of scrappy work done today--yay! And keep checking in over there-I have a bunch more holiday ideas they plan to feature! YAY! 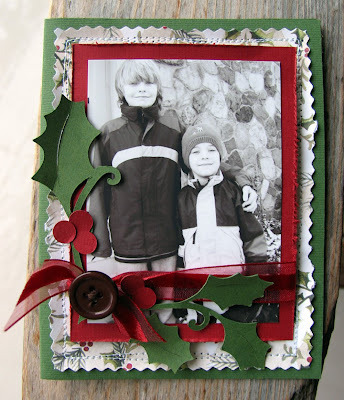 These two cards have been published in Paper Crafts-I love making stamped cards for Christmas. And I love adding gold or stickle sparkle too!! 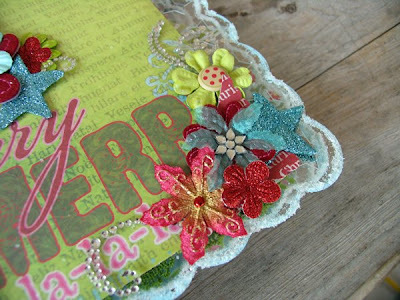 This card is over the top embellished-but I love it! I have an idea about how to use it differently-so I think I will do this and post it after the weekend!! I used the Voila as a mask and sprayed with glimmer mist. Then I added the trim at the bottom and tons of flowers. 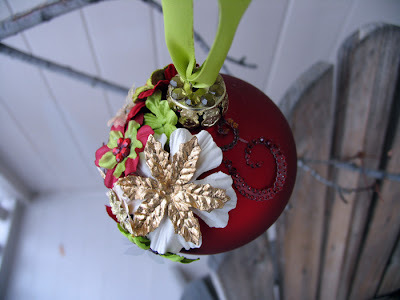 This ornament was made a while back for a magazine project through Prima. I still love it and thought it was a great idea to share. I cut a circle from chipboard and covered both sides with paper. 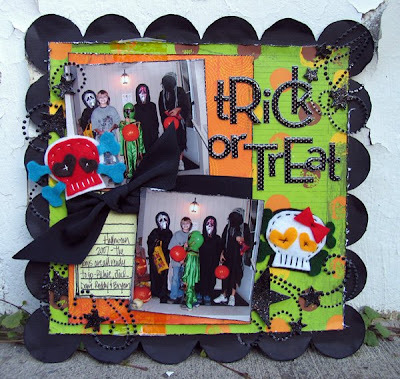 Then cut a left over photo and placed it onto the prepared chipboard. Then embellished and added ribbon to hang. So easy-another great idea for the kiddos!! Thats all for today!! I will be back soon! Lots of things to share!!! The Bad Girls December Kit is now revealed!! 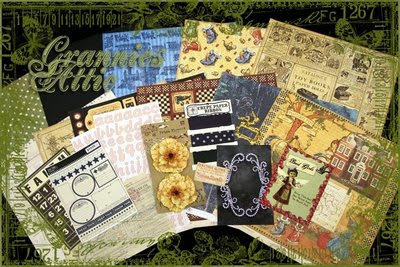 Grannie's Attic: so vintage and shabby chic-lots of goodies and amazing papers! This kit was a challenge for me to create with, I'm not used to using paper lines like this but I have to admit-the challenge was fun and I love the layouts I created! And the add-ons are to die for!!! These are photos of my Dad as a little guy, wearing a sailor suit my Grandmother loved! He looks so adorable! 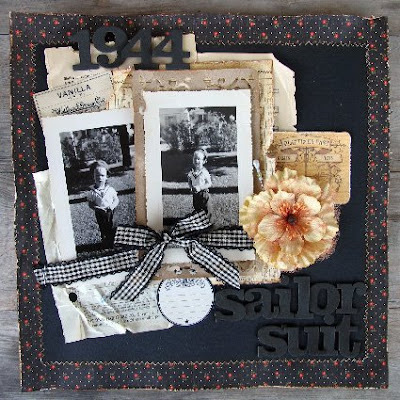 I loved working with these older vintage photos!!! Another LO using photos of my Dad--he was sooo cute! Grandma was great about taking lots of photos of him when he was growing up--thanks Grandma!!! 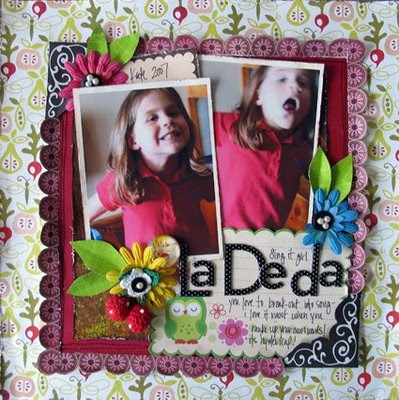 I cut out some of the images from the paper, used an old receipt from the kit and love the crepe paper by Jenni Bowlin-she is genius! This is a photo of my Grandfather-he was always working with his hands. Back then, everyone knew how to make their own repairs, wiring, plumbing, building...amazing times! 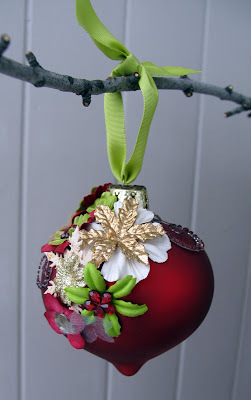 This ornament was so easy to create-I love the vintage look of it!! And as it turns out-my Mom snagged it for her own tree! LOL!! All you need to do is accordian fold a 3in x 12 in piece of paper-two of them! Using heavy duty tape to attach and add a circle chipboard piece for the back to make it more sturdy. 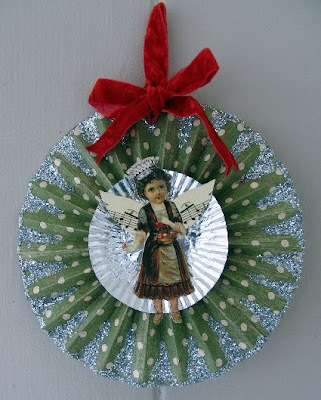 Use a cupcake paper cup for the center and cut out the little vintage girl for the center. 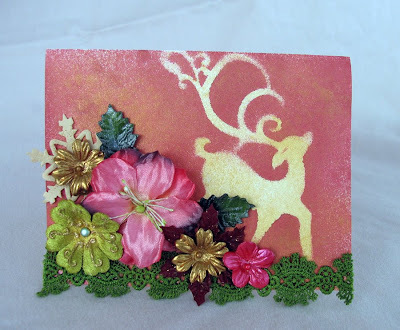 Add glue around the outside and in the creases-then sprinkle with glitter! 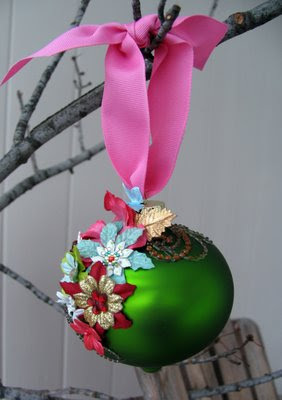 Add some velvet ribbon to the top to hang it with--you're done! And as promised-a cute little book to use as a gift this year! 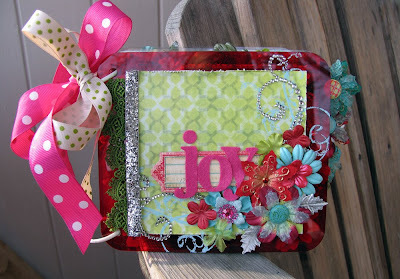 I used a Melissa Francis flower mini book for this project! 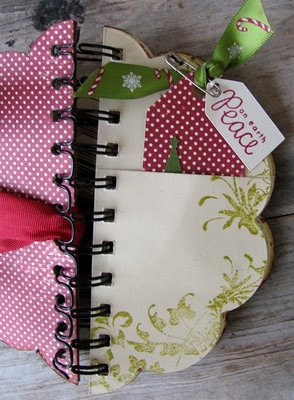 Cover the front with patterned paper and tie some ribbon around it. Then attach a tag with a small saftey pin. Ink the edges too if you like! Make everyother page a pocket page-take out all of the pages from the book-cut 5 of them about 1/3 off the top. Replace them in the book, everyother page and adhere around just the edges so you have a pocket. 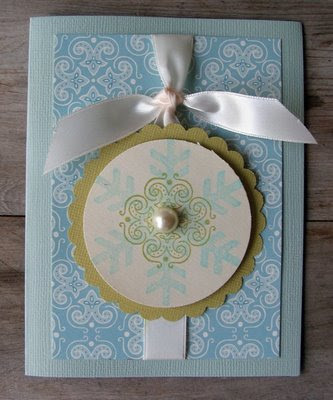 Stamp fun swirls or snowflakes onto the pages. 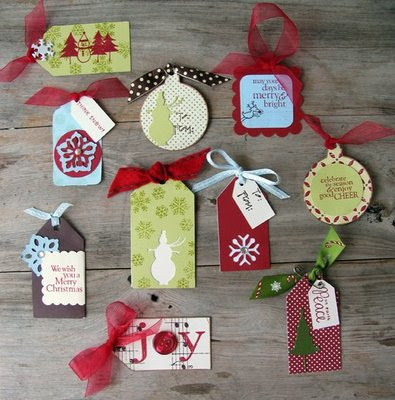 I used my Cricut machine to cut out a bunch of different tags, I stamped on them and embellished with ribbon, brads, etc! Fun to make-the kids can help with this too! 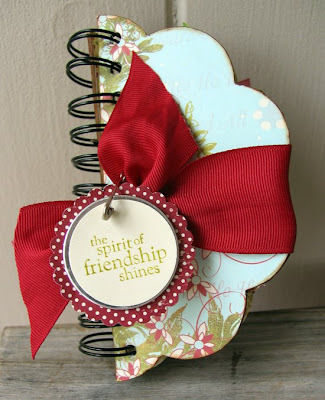 Then give it as a hostess gift of a friend so they can use them as To/From for their gifts. And the book can be used for something else later after the tags are gone! Thas all for today! I'll be back tomorrow!!!! 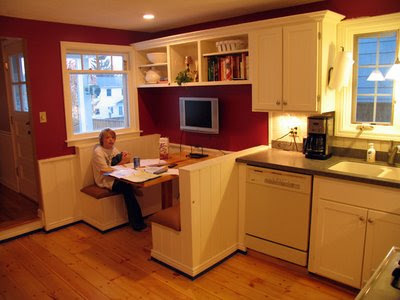 Thanks for the sweet comments about the kitchen! I am so glad it's finished-- we are enjoying it everyday! Christmas has officially begun in the Fennell household! Tonight we decorate our tree and then it's finished! Everything else is out and decorated...it's such a nice feeling! Of course I still need to make cards, cookies, gifts, shop and wrap! EEKK! But I will get it done-I always do. The Barbies are coming over for a cookie exchange on Friday-I can't wait! I wanted to share some of my creations I have been busy making for the past month or so. I made several projects for Provo Craft for the Michaels website. 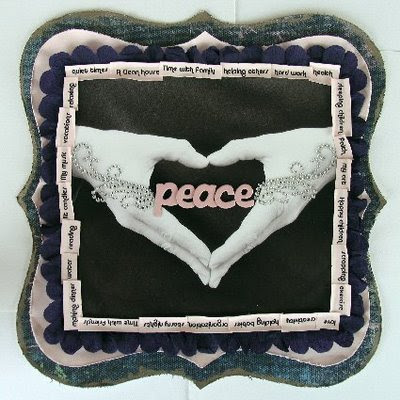 In case you were wondering why you haven't seen anything new in my Provo Craft gallery-I have been creating projects for Michaels for about a year now, so thats where all of my projects are posted. 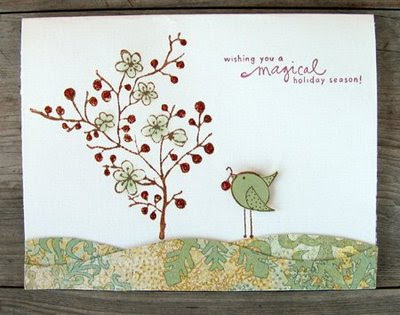 Here are some I have made for the holidays recently using the Cricut--this machine rocks! If you have been thinking about gettng one or you have one you don't use-play around with it-it is so fun! 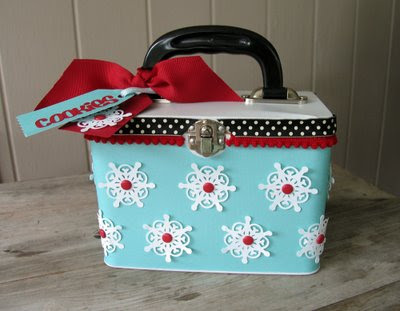 A cookie tin wrapped in cardstock, decorated with snowflakes, trim, ribbon and tags-this can be used as a decoration after the cookies are long gone! 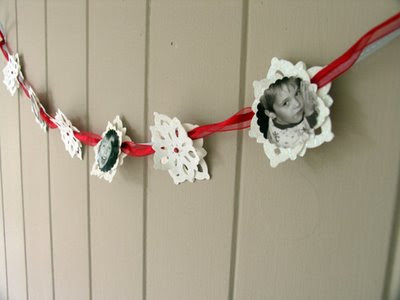 And a snowflake garland, with photos! 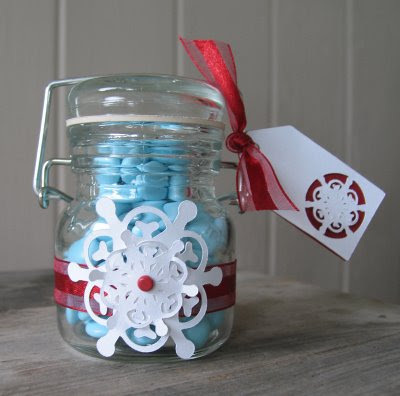 I glittered every snowflake and layered them. 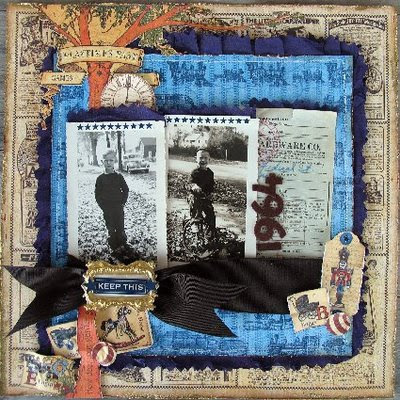 I weaved two different ribbons through each one and added photos on every other snowflake. 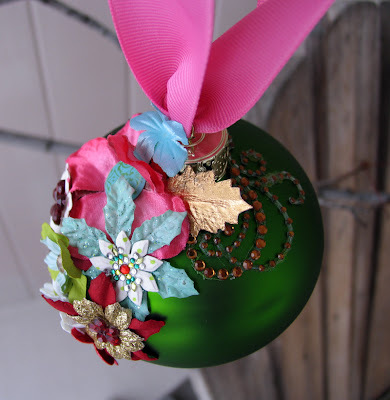 This will look awesome on any tree! 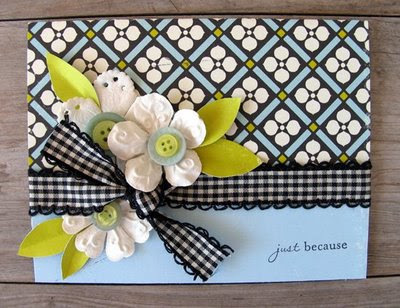 These are little gift cardholders. 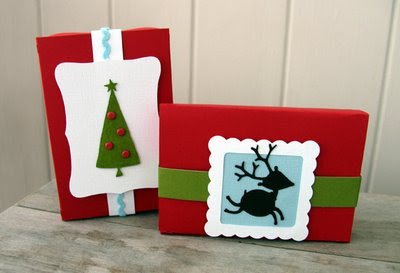 I made boxes from cardstock and then decorated with some cute images...these boxes are from last year but I still love them and the idea! 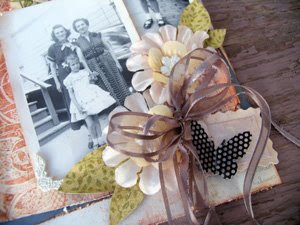 And this is a photo card idea-kind of shabby looking with fun paper accents and ribbon.... So thats it for now! I plan to post gift ideas every other day-I have so much to share with everyone! 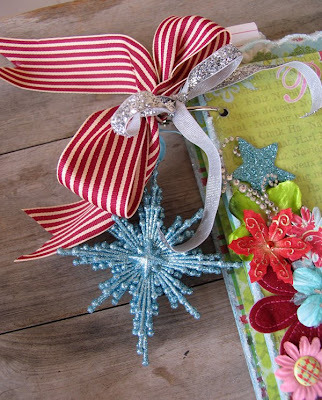 Some ideas include mini books that can be given as presents even if they aren't Christmas themed. Thanks for stopping by! OK-I haven't been around much on the blogger side of life. You know how things get crazy-one thing after another? And I had a ton of projects to do-so i have been busy at my table creating! But first I will show pictures of my kitchen!! I am so happy with it!! The only bad thing-I can't find my before photos---sigh... no idea where they went. 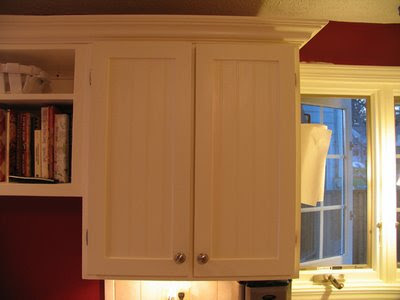 I included some work in progress pics too!I refaced all of my cabinets myself-it was so fun! But a lot of work! 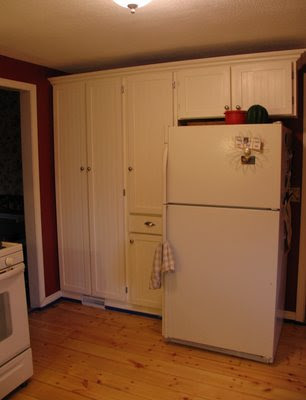 Trust me-the whole kitchen was dark brown wood everywhere you see white now. And The floor and counter were blue! yuck! I've had a lot of projects due lately as I said before! 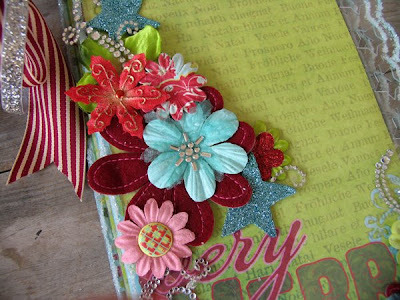 I made a Christmas Album for the Bad Girls Worshop but i had a ton of scraps left over so I decided to do another! Thats all i can post for now!! I will be back with more goodies soon! There is blog candy on the Bad Girls blog-a $50 gift certificate is up for grabs! and the 22 classes are free!! Love that! 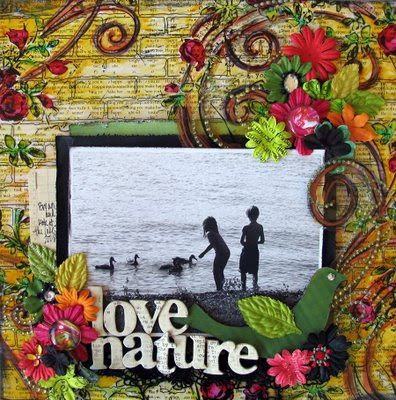 Fresh ideas with funky twists, easy to recreate and it's fun to go over there and hang with all of the BGs. 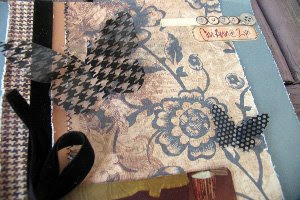 I have been very busy creating my project for it and I am bursting at the seams to share...so here are some sneak peeks!! Kitchen News: It is finished!!! The countertop was installed yesterday and it is gorgeous!! I am taking photos today so I can share my new lovely room!! I placed all of the names in a bowl and Jack pulled out her name! Congrats girl! And tonight is Bad Girls reveal for November kit! 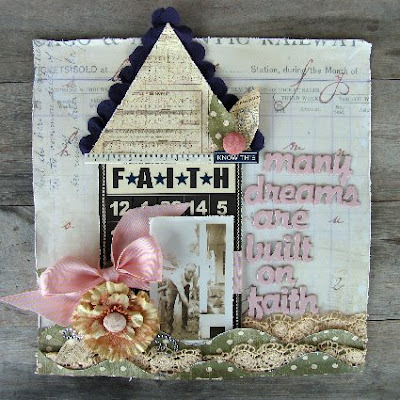 Loved this shabby chic kit! Here are some sneak peeks for all of the BG stalkers!! Better late than never! Thats all for today! 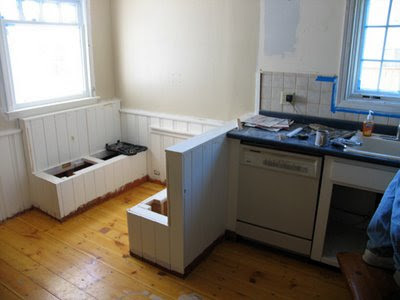 I am getting near the end of my kitchen remodel-lots of sorting and cleaning to do! And adding the finishing touches today! Wish me luck-can't wait for life to get back to normal!!! 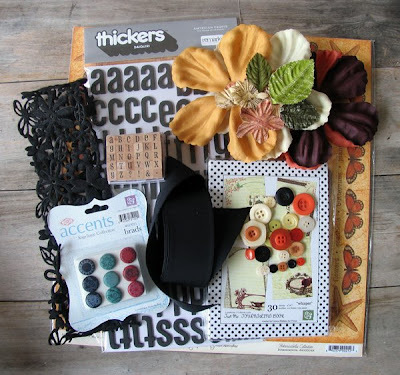 Graphic 45 Botanical Line, Thickers, ribbon, felt strip, brads, buttons, journal sheets (a whole box! 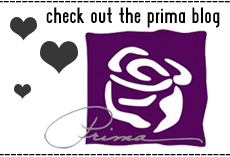 ), buttons and some cute mini stamps! 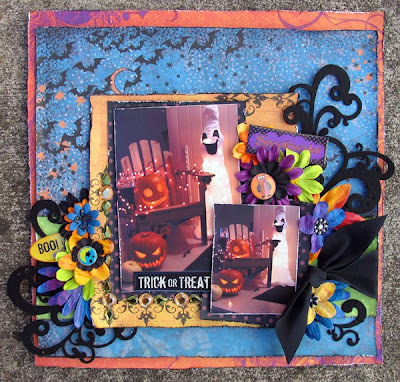 Here is my new Halloween layout-I used Voila felt and flowers that are not traditionally Halloween. 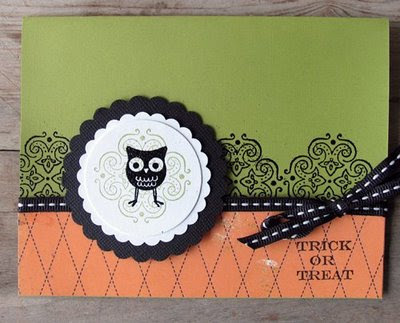 I also used Prima Build A Bauble stamps, new Halloween Line, swirls and everything else under the sun!! LOL! 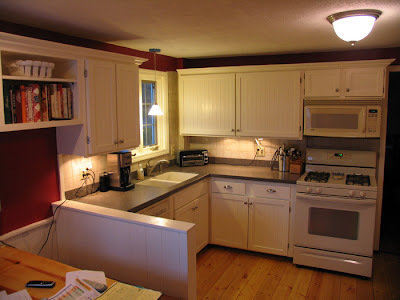 Last but not least-some kitchen photos--it's coming along slowly but surely! My hands are so swollen and cracked!yuck! But it is all worth it-it's going to look great! I have a ton of painting to do today and sanding on the new doors...but the good news is-our floor is finally done!! it is so beautiful-I will post photos of that soon! I was asked to guest design this week for Pencil Lines!YAY!! I had so much fun and the sketch was so awesome! It was created by Anna Bowkis. 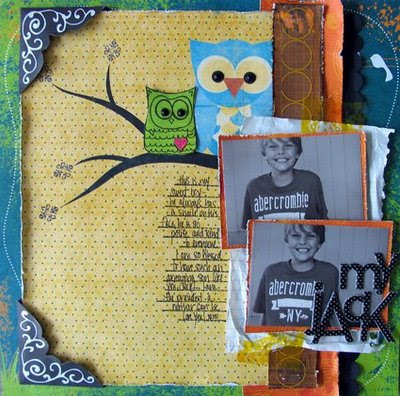 The design team over there seriously rocks, so I was tad nervous:) I used all Prima except for the Thickers in the title. 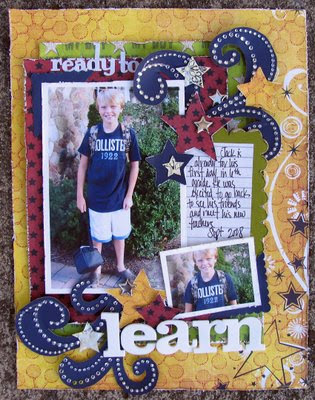 The lines I used were "My Guy" and some of "Space Boy"-love that they came out with 2 boy lines since I happen to have two boys;) The pictures are of Jack on his first day of school-6th grade-can't believe it!!! 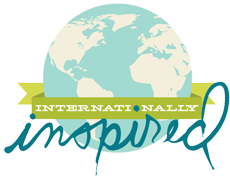 Check out the site-they have so many wonderful ideas and sketches-the site is truly inspirational!! Bad Girls News-Top Designer is now down to 11 contestants!!!!!! The talent throughout the entire contest has been jaw dropping and elimination has been tough!!! So now we are into final exam week and we shall see what they come up with!Wendy's class is basically calling for free form art work or a project I should say-WOW!! Looking forward to seeing their gorgeous creations! Keep a close eye out in the gallery! So thats it for now! 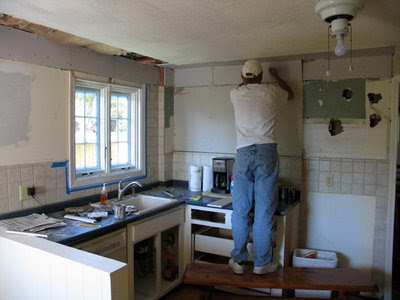 I am up to my eyeballs in dust and debris-we are renovating our kitchen!! YAY! And I am getting my hands dirty! Pulling up floors, painting, and I am refacing my cabinets myself!! That's right-working with saws, sanders and a nail gun-yikes! I will post photos soon-I have been taking them as I go along. And I am way behind on return phone calls to Nic, Sherry and whoknowswhoelse?? 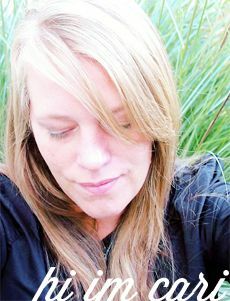 ?I also need to MSN my dear friend Ingvild-she thinks I have fallen of the face of the earth! I just taught a big card event this past weekend-it was so fun! I love seeing all of the ladies that attend every session, they were full of it this time around! I think everyone is eager to create after a busy summer and the weather starts to get cooler. Here are the cards they made: I kept them simple with the idea that we have a limited time to make these per table but also keeping in mind that these would be easy for them to recreate. 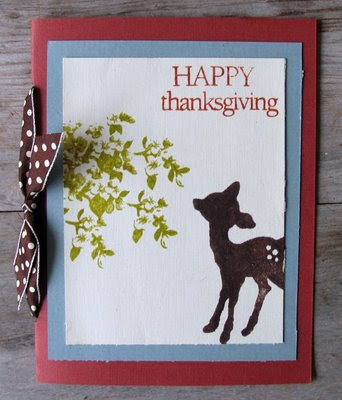 And the designs are perfect if you need to make a lot for the holidays or switch them out for another occasion. And here are some layouts I made for Bad Girls using the October Kit. I LOVED the color combos in this kit----awesome!!!! And the little knit strawberries are too cute!